Rolling updates are not possible prior to Version 7.5. Or in other words: the first update that can be done in the way described on this page is the update from version 7.5.x to 7.6.y. Also note that it is only possible to update from one minor version to the next. For example, it is possible to update from 7.5.3 to 7.6.2 in a rolling fashion but it is not possible to update from 7.5.3 to 7.7.2 in one go. Before the rolling update from one minor to another can be executed, the latest patch, of the current used minor version, must be applied. More considerations for rolling updates can be found at the bottom of this page. Make sure to read them. What is a Rolling Update? A rolling update is a process to perform a Camunda update in a cluster. The nodes are updated one by one or in groups. During the update process, it is ensured that at least one node is available to handle incoming requests, guaranteeing availability and minimizing downtime. The above picture displays an example system. 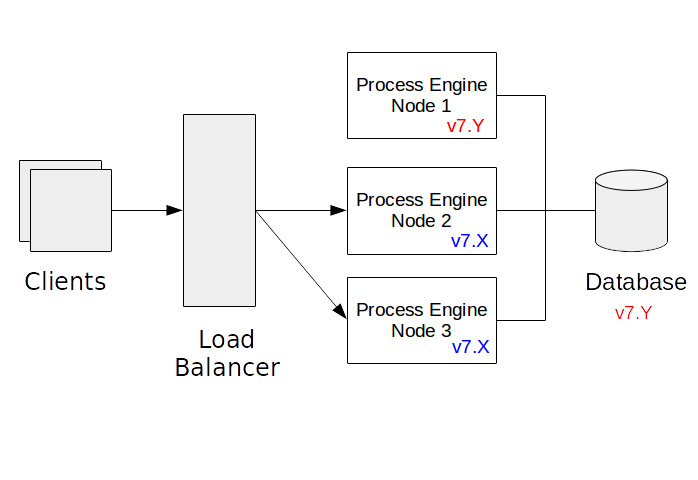 There are three process engine nodes connected to a shared database. A load balancer distributes requests to the Process Engine nodes. “Process Engine node” shall be an instance of an application or application server hosting a process engine. It must not necessarily be a separate physical host. Update the Camunda libraries on all nodes, one by one or in groups. A 3-node cluster is used in this document for illustration. Obviously, the procedure can be generalized to a N-Node cluster. Before the rolling update for minor versions can be executed the nodes and database have to be updated to the latest patch version of the current minor version. To do so the rolling update process can be used. In that case the update will be from 7.X.x to 7.X.y, where y is the latest patch version of the minor version 7.X. The following sections provide a step-by-step walkthrough of how to perform a rolling update. In this example, we use the version 7.X to signify the Camunda version the cluster is migrated from. We use 7.Y to signify the Camunda version the cluster is migrated to. Camunda does however not guarantee that the database schema update script can be applied on-line without issues. Depending on the database and the current load, the script can take a long time to run or may block other transactions from making progress. (See the Considerations section at the bottom of this page for details). Users are strongly encouraged to test the schema update script in a staging environment prior to executing it on a production database. After the update of the database schema is completed, the Camunda library version can to be updated. The following steps need to be done for each node or group of nodes. Grouping nodes makes the update process faster, at the expense that fewer nodes are intermittently available to process requests. An approach could be that 33% of the nodes are updated in parallel. In this case 66% of the nodes are available to process the requests and 33% are offline during the update. First, a node is isolated. Usually this means that the load balancer is configured in a way that no new requests are sent to this node. Once all open requests are processed, the node is successfully isolated and can be taken down. When using an embedded process engine, the application bundling the Camunda libraries needs to be re-packaged with the new version of the libraries and re-deployed. When using a shared process engine, the libraries and applications deployed to the application server need to be updated. After the update is complete, the node can be brought back up. In this step an updated node is re-integrated into the cluster. This usually means configuring the load balancer in a way that requests are routed to this node. To facilitate updates, Camunda ensures backwards compatibility of the database schema. Backwards compatibility makes it possible to operate an older version of the process engine on a newer version of the database schema. This property is crucial in the first step of the rolling update process: after the database has been updated, the process engine libraries are still at the previous version. Note that Camunda does not guarantee that the migration script is applicable on-line (concurrently to in-flight transactions). While Camunda does its best effort to ensure this property, it is not guaranteed. It is therefore strongly recommended to test the database migration script on a test database with a similar load to the production database. During the rolling update process, it is not permitted to use new features of the newer engine version. This means that it is not possible to “roll out” a new version of the BPMN processes or of the application making use of new API methods while also updating the library. The reason for this is that while performing a rolling update, there is a time frame in which both older and newer versions of the process engine library operate on the database concurrently. During this time, usage of new features of the new engine like deployment of a BPMN process with a newly supported symbol would cause problems with the old engine. It is only possible to update from one minor version to the next. For example, it is possible to update from 7.5.3 to 7.6.2 in a rolling fashion but it is not possible to update from 7.5.3 to 7.7.2 in one go.